I’ve shared how the “crazy comes in waves“. Fortunately, as baby Knox grows the distance grows between crazy waves. There are still moments when all the “should”, “want” and “need” tasks pile up and paralyze me from doing anything. Life feels full. I feel worn empty. God provided encouragement in the oddest of ways. Remember the sermon book my dad read from at my grandmother’s funeral? (if u don’t remember it’s okay, you can read about it –>here<–). I looked up one of the authors mentioned in my grandfather’s notes. The author’s name is James Gordon Gilkey (1889-1964). In researching I found Mr./Dr. Gilkey wrote several books (“The Certainty of God”, “A Faith for the New Generation”-1926, “The Problem with Following Jesus”, “You Can Master Life”). “Most of us think ourselves as standing wearily and helplessly at the center of a circle bristling with tasks, burdens, problems, annoyance, and responsibilities which are rushing in upon us. At every moment we have a dozen different things to do, a dozen problems to solve, a dozen strains to endure. “We see ourselves as overdriven, overburdened, overtired. This is a common mental picture and it is totally false. No one of us, however crowded his life, has such an existence. What is the true picture of your life? “Imagine that there is an hour glass on your desk. Connecting the bowl at the top with the bowl at the bottom is a tube so thin that only one grain of sand can pass through it at a time. 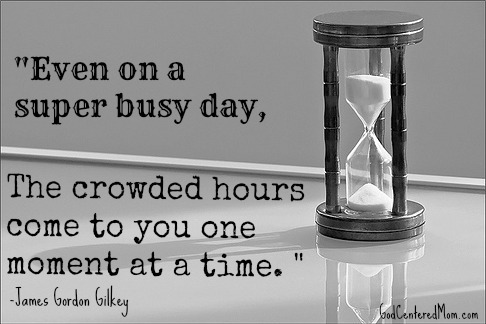 That is the true picture of your life, even on a super busy day, The crowded hours come to you always one moment at a time. Universal truths and feelings never cease to amaze me. The fact that Mr. Gilkey wrote these words almost 100 years ago and they could help focus a scattered mom’s mind…amazing. I pray I can take each grain of sand as it comes…single file. I pray I don’t get distracted focusing on the grains which have yet to fall. Give me eyes for this moment. To take these tasks and complete them well. Focus my heart on what matters to You. In my discipline and training of those boys may I focus on what concerns You. Give me Your love for those in my life. Oh WoW this is a post to save and rint! Every time I feel overwhelmed I remember you post about crazyness comes in waves. I love how God’s truthes are timeless. You make me think above all in this period of my life very very busy.. but with my mind that is overcrowded with thoughts by now…. It is not always so easy to taked a frain at a time.. Taking in a deep breath this morning. Thanks! I really needed this today, Heather! Thanks so much for sharing.